Suitable for sensitive and / or damaged nails caused, for example by the use of artificial nails or illness. TIP: Use in combination with TRIND Keratin Nail Restorer for extra strong nails. 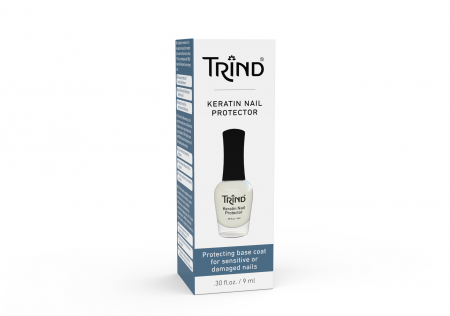 Apply a thin layer of TRIND Keratin Nail Protector on the nails as a regular base coat (on bare nails or after using TRIND Keratin Nail Restorer). Make sure the layer is completely dry before applying a colored polish or top coat. For optimal results, use in combination with TRIND Keratin Nail Restorer. This treatment can be used as long / often as needed, depending on how badly the nail is damaged or to get the desired result (Step 1: Remove old layer every day with TRIND Nail Polish Remover. Step 2: Apply TRIND Keratin Nail Restorer, massage into nail and allow to dry. Step 3: Apply TRIND Keratin Nail Protector on top). After use, clean the rim of the bottle.